If you own and operate an automobile, chances are you are well aware of the optimal importance safety plays when behind the wheel of a car. In a perfect world, assuming every licensed driver operated their vehicle with the utmost, attentive focus, auto accidents would be a rarity. Unfortunately, however, this is not the case with not only seasoned drivers but with newly licensed teens as well. Texting while driving has now become a greater hazard than driving under the influence in the U.S., accounting for 1.3 million (23%) accidents in 2013 alone and climbing. Driving while drunk or impaired was the cause of 20% of auto accidents nationwide that same year. What these numbers indicate is this – we can almost expect for a large portion of the drivers we share roads with to be dangerously negligent, distracted or outright reckless! So the question begs - how much of a distracted driver are you? Take a loot at what been documents as the most common distractions while driving. Mobile phones - We use our mobile phones for everything: calls, messaging, email, Internet, games, and even as a GPS. Mobile phone use while driving has become such a problem that there are now strict laws in place to control their use. Food and drink - It can be hard to resist pinching a few fries after going through a drive-through restaurant, but some drivers will attempt to eat an entire meal with one hand on the wheel. 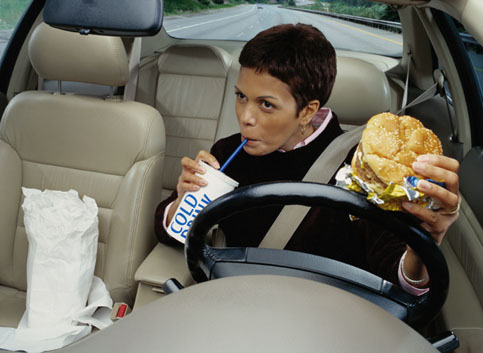 Messy and not the best for digestion, it's also a distraction on the road and can make the eater/driver reckless - research suggests that eating a cheeseburger while driving can be more hazardous than talking on a mobile phone while driving. If you must bring a hot drink into the car, it's worth looking into a no-spill travel mug that you can store in a secure cup holder. Even better, get one that keeps your drink hot so that it will be at optimal drinking temperature once you've arrived. Pets in the car - Few pets stay still in a moving vehicle, and it can be very distracting for anyone in the front seat. Getting your pet as comfortable as possible and having appropriate restraints within the car can prevent your furry friend from distracting you. There are laws in place about travelling in cars with pets, so make sure that you're familiar with these before driving off. Kids in the car - Squabbling or bored children can be equally distracting. It doesn't matter how short or long the drive, it's essential to keep your kids entertained so that you can focus on the road. Our advice? Keep favourite books, magazines, and toys in the car and within easy reach, so that you can dissolve any boredom or potential fights in quick time. The sun on the horizon - Driving into the sun at dawn or dusk can be particularly distracting if it forces you to squint. Sunglasses are a must, and pulling down the sun visor may help. If the sun is right in your line of vision, try adjusting your sitting position so that your eyes are shaded; if it's unbearable, pull over and wait the 10 minutes for the sun to rise or set - it's safer and a much nicer way to appreciate the beginning or end of the day. Tuning in - can cause you to tune out. Flicking between radio stations, changing CDs or selecting a song on your music player can steal your concentration away from the road and causes you to be a hazard to yourself and other road users. A hottie -Well, helloooo! In a survey taken by Allianz last year, 51% of male drivers admitted to getting distracted by an attractive pedestrian when driving. And it's not just the men with wandering eyes - 15% of women admitted to taking in the scenery! A surprise - Car accidents can happen when something surprises you while driving. A spider in the car, a bee sting, or a passenger sneezing, can give you a fright and cause you to panic and slam your foot on the brake or to swerve. Keep your cool and pull over somewhere safely; and then you can sort out whatever has distracted you and take your time to calm down before rejoining the traffic. Vanity - Hey there, good looking! Primping or grooming in the rear-view mirror is a surprisingly common distraction for drivers. Applying make-up, fixing hair, adjusting your clothes or simply appreciating your reflection can divert your attention away from what's happening around your car. If you or a loved one has recently been involved or injured in an accident with a distracted driver, you're entitled to compensation for your medical expenses, auto repairs, and punitive damages. Here at The Law Office of Neil Flit, our team of law professionals will support and guide you through the process of your legal claim. With our small team of highly knowledgeable attorneys, we pride ourselves in our ability to guarantee the personal attention necessary to handle your claim in a timely fashion and hold liable parties responsible for their actions to secure the settlement you deserve.